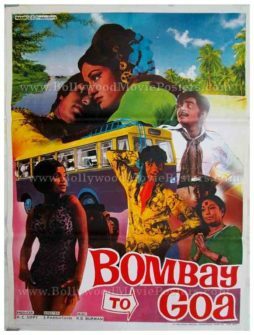 Old Bollywood movie poster of the memorable Hindi film, Bombay to Goa (1972) for sale. This is an actual surviving vintage poster of the 1972 comedy film that featured the biggest superstar of Indian cinema, Amitabh Bachchan in the lead role. Bombay to Goa (1972) was the first Hindi film which starred Amitabh Bachchan in a lead role, making this poster highly collectible! Amitabh Bachchan had appeared in a few Hindi films prior to Bombay to Goa, but this was his first role as “hero.” His earlier films such as Saat Hindustani (1969), Parwana (1971) and Aanand (1971) saw him cast as a supporting actor. It was after the success of Bombay to Goa that Amitabh’s prowess as lead actor was established, winning him lead roles in subsequent blockbusters such as Zanjeer(1973). Printed and circulated several years after the release of the film, this vintage movie poster was originally designed for publicity of the film but never ended up being used. This poster was originally designed by cutting out images of actors from separate still photographs (shot on set location) and pasting them on a board. The background and typography are hand drawn / hand painted, which makes this poster an interesting mix of two very different design techniques. In the poster, Amitabh Bachchan is seen in a romantic pose with actress Aruna Irani on the top and as a dancing figure at the center of the poster. A photograph of Shatrughan Sinha is shown on the top right, while Aruna Irani is shown wearing a bikini on the bottom left. One of the greatest comedians of Bollywood, Mehmood is shown on the bottom along with actress Lalita Pawar. The typography used in this poster is entirely in English. The bus coupled with the photographic beach landscape as well as the milestone styled typography on the film’s title are indicative of the journey that the plot revolves around. Bombay to Goa is a 1972 adventure comedy Hindi film starring Amitabh Bachchan, Shatrughan Sinha, Aruna Irani and Mehmood. The movie is known particularly for its songs, thanks to brilliant compositions by one of the greatest music directors in Bollywood, RD Burman. The film is a remake of a 1966 hit Tamil film called Madras to Pondicherry. Following its success, it inspired a recent remake by the same name released in 2007 starring some of the finest stand up comedians on television. One of the songs from the film, “Dekha Na Hai Re Socha Na Hai Re” sung by Kishore Kumar has spawned dozens of remixes and is played till today.